You are here: Home › Things to do in Houston › travel › What are the most popular Houston beaches? The school year may be close to starting up, but that doesn’t mean beach season is over. And fortunately, you don’t need to trade in your jet skis for schoolbooks — you can still have both. While it may be time in the northern states to start putting on layers of clothing, the beaches near Houston boast magnificent weather well into November. And with the change of season comes a break from the sweltering heat that may have kept some people inside all summer long. With temperatures hovering around the 70s and 80s during the day, you can happily lounge on the beach all day long. These ideal conditions leave your options wide open. Kayaking, boating, building sand castles — enjoy whatever your heart desires. 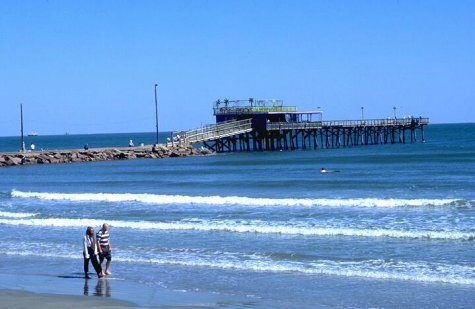 A weekend at one of these Houston beaches is just what you need to keep your balance. And whether you’re on a romantic getaway, a fun family adventure or out for a weekend with friends, these Houston beaches offer just what you are looking for. Take a walk down the boardwalk and stop inside some of the shops and restaurants, or hop on one of the whirling amusement-park rides Kemah has to offer. This family-friendly beach town was once a small fishing town, lending it even more charm. The famed Lighthouse District is a must. This is the Houston hot spot! Galveston offers a variety of outdoor activities, including the popular Schlitterbahn Galveston Island Waterpark. Party areas like East Beach attract visitors, but more reserved spots like Stewart Beach offer alcohol-free fun for the family, too. With so much to choose from, it’s hard to go wrong with a trip to this seaside city. With its laid-back attitude, this Gulf Coast location is easy to fall in love with. It has the quaint atmosphere to make you feel like you’re out of the hustle and bustle of Houston without hopping on a plane. Crystal Beach is the most visited destination, but many other attractions will grab your attention. If you are in the mood for a grander getaway, you may find the vacation vibe you’re looking for by driving south to South Padre Island or Corpus Christi. Whether you are visiting from out of town or you want to enjoy a stay-cation, you won’t be disappointed by the culture and scenery the Gulf of Mexico has to offer.